Hey hey hey! It’s time for Mixels review number eight, and I still have no idea why I’m taking so long to put these short reviews out. These should have been done weeks ago… but then again there have been other things to contend with. Well this Mixel has an interesting shape, but those short and stubby arms don’t appear to have much articulation. As always though, let’s reserve our judgement until we’ve built the thing! As with Teslo, Zaptor comes with a number of interesting parts. Take the Yellow “baby bows” for example: there are four in this set, compared to the two found with Teslo… but Volectro (the final Mixel in line) comes with eight. 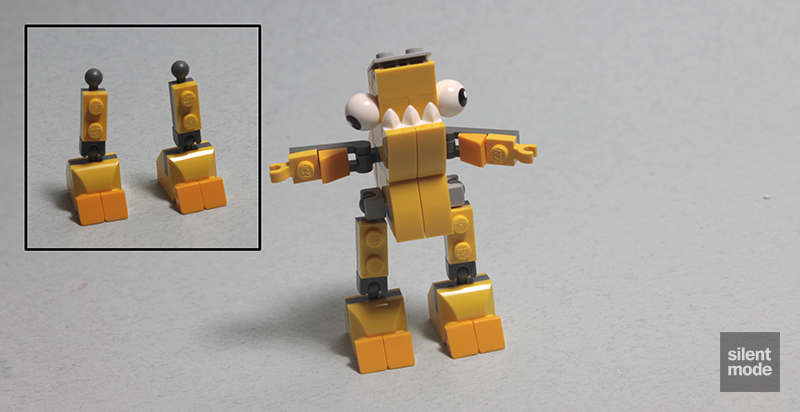 The other Yellow parts are fairly common anyway, but they are useful and nice to have – especially those 1×1 SNOT bricks. The Bright Light Orange 2×2 45 degree slope comes in four other sets, with the most plentiful found in the reassuringly expensive 70010 The Lion CHI Temple, which contains a lot of other cool parts, so I hear. We also get a massive 13 cheese slopes in Bright Light Orange, and this set is currently the best source for them. If you’re a fan of the new joint parts, like I am, you’ll be pleased to see three pairs of them in this set; all of which, as we can see from the packaging, are used for Zaptor’s legs. This is an impatient screenshot! Building Zaptor is fairly straightforward and quick, starting with the familiar “core” pattern. Note the hinge brick at the back, which is positioned at a specific angle with the help of two cheese slopes. 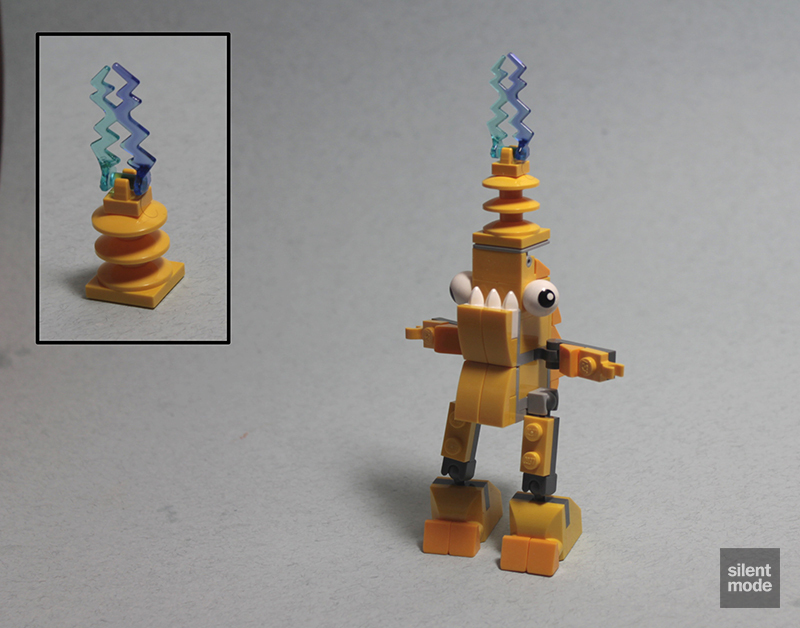 Unlike most of the other Mixels characters, Zaptor’s legs are identical. They’re also comfortably long, meaning that Zaptor doesn’t have to waddle, or Shuff around. With the lethally charged coil placed on its head, the world witnesses the rise of Zaptor: a one-track minded, strictly focused member of the Electroids tribe, who can’t go a minute without strategising its next move. Let’s turn to LEGO’s Shop@Home page for a more feasible description. Up for anything, ZAPTOR is the super-charged adrenaline junkie of the Electroids, a quirky tribe of Mixels who live high up in the mountainous forest close to the lightning storms that power them. Capable of releasing massive blasts of energy and blinding light, ZAPTOR can give his friends sunburn. They would prefer it if this living lightning rod of a Mixel directed those high voltage blasts at the Nixels! I was incredibly far off the mark this time, but that’s okay. Very similar leftovers to Zaptor, but the Yellow 1×1 round plate is much more satisfying than a half Technic pin, IMO. I don’t have much to say about Zaptor at all, if I’m honest. 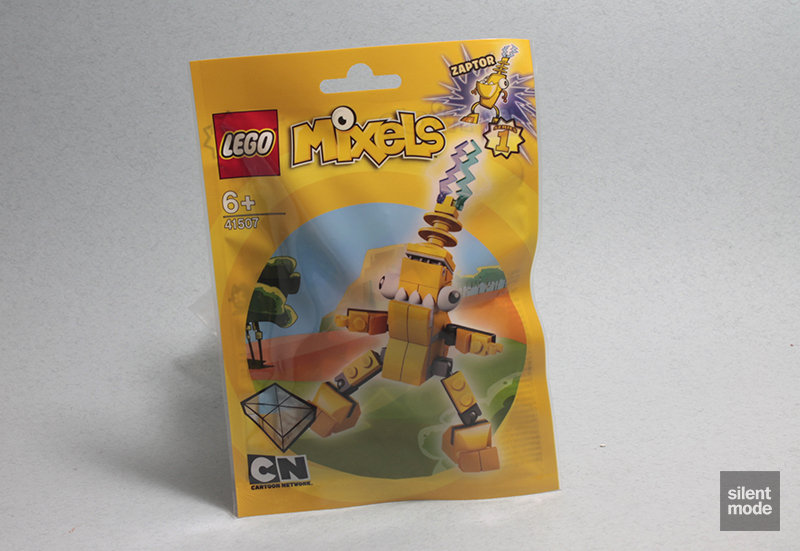 I appreciate the fact it has those useful long legs, and it comes with all those useful parts shown above… but for me it’s the least interesting out of the Electroids Mixels. Definitely get one to complete the family, or if you want those Bright Light Orange cheese slopes – but one of the other Electroids may serve you better for other parts. I’m giving Zaptor 6.2/10 – I’m not a huge fan of this one, but you might like it.